This month we look at the last letter in the acrostic S-I-M-P-L-I-F-Y, our guide to walking through the downsizing and moving process. “Y” is for….You’re done! Well almost. You have spent a lot of time sorting, made hundred of decisions, donated or sold your extra possessions, packed or had the movers help with packing, and moved into your new place. Congratulations! Well done! However you aren’t quite done yet. You are now sitting in your new home amid boxes, blank walls and furniture that doesn’t quite feel like it fits. What should you do next? How can you make it feel like home? You found your new home now help your possessions find theirs. Although it may seem overwhelming to see so many boxes sitting around, if you take it a little at a time it won’t take long to conquer them. Start by unpacking the areas you use the most. This might be the kitchen, bathroom, or maybe even the office. Before you unpack any boxes, stop and think about what items you will be keeping in each specific area. Consider the best place to store each category of items. Should they be located in a particular area like by the stove, tub or bed? Should they be easily accessible or can they be tucked behind items or where they are a little harder to reach? Giving some thought to placement beforehand will prevent the need later to shuffle items when you realize you want something else in a specific cabinet. 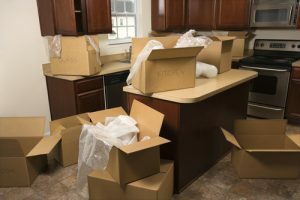 It maybe helpful to list the proposed contents of the cabinet on post it notes and place on the outside of cabinets or closets before unpacking.(i.e. this drawer for silverware, this cabinet for linens, etc). These post-it notes are not just helpful during the unpacking process, but if left in place for the first week or two they can be great reminders where to find items in your new place. Although you might be tempted to get the artwork up on the walls right away, furniture placement should be your next step. Do a walk through your new home making sure that doorways, important outlets, or windows are not blocked by furniture pieces. If you have chairs or stools that will be moving in and out, make sure there is adequate room for that movement. Remember you can be creative with furniture use or placement. Just because a piece of furniture was in the bedroom or living room at your old place doesn’t mean it has to go in the same place in your new home. Perhaps your dresser doesn’t fit in your new bedroom but it can fit nicely into a large closet or can be used in the living area to hold linens or puzzles. Next make your new home your own by adding your art or personal touches to the walls. Be sure each piece is hung securely with the proper hangers. Again you may need to be creative if your previous arrangement does not work on your new walls. Remember the best height to hang artwork is usually eye level. There may be lots to do to settle in, but you can do it. Tackle a little each day but make sure to take time to get out and enjoy your new community. With the boxes unpacked, the furniture in place and the art hung, you can sit back relax and enjoy your new home!